Your customers expect fast, efficient customer service at the checkout to cap off great shopping experiences. 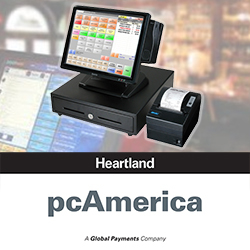 Heartland pcAmerica’s Cash Register Express point of sale (POS) solution helps you deliver. Heartland’s pcAmerica POS solution is designed to require the fewest number of touches, which means faster checkout and more productive employees. With pcAmerica, you can customize the display to align with your business’ unique workflows. pcAmerica streamlines processes so you and your team can devote more time to other areas of your business and more importantly, to your customers. In addition, this industry-leading POS solution enables you to administer an effective loyalty program and analyze customer data to provide targeting marketing and personalized offers. Great customer experiences are only a part of what Heartland pcAmerica offers. It also equips you with tools that make managing a profitable business easier. Labor scheduling: Automate labor management with scheduling and time clock functionality. Reporting: Access sales, scheduling, and inventory data to help you make informed business decisions. Loss prevention: Control shrinkage with access control features. Streamlined processes: Integrate sales tax and commission with accounting software. Scalability: Heartland pcAmerica scales to support business growth and to meet new demands. and see for yourself how Heartland pcAmerica can benefit your business.